Butter chicken or Murgh Makhani is an Indian chicken dish in a perfectly spiced curry sauce. One of the most-enjoyed dishes from the Indian subcontinent, this flavorful chicken with heavenly aroma of the garam masala and fenugreek is cooked in a creamy sauce with plenty of seasoning. Garam masala is an intensely flavored spice blend that imparts a distinctive flavor to this dish. While the fenugreek imparts a sweet yet slightly bitter flavor with hints of caramel or maple syrup. The pressure cooker helps deliver the stew-like dish in about half-an-hour so you can delight your family with it even on a busy weeknight. Melt ghee in a pressure cooker set to Sauté. Stir onion and 1 teaspoon salt into the ghee. Cover cooker with a glass lid and cook onion until soft and translucent, 2 to 3 minutes. Stir ginger, garlic, turmeric, and red chili powder with the onion to coat; continue cooking until fragrant, about 2 minutes. Separate the coconut cream and water into separate bowls. Stir the water from the coconut milk can, chicken, and pureed tomatoes with the onion mixture. Select Pressure Cook (Manual) and cook for 8 minutes on High pressure. Press Cancel and set pressure cooker to Sauté. Stir coconut cream, half the cilantro, tomato paste, fenugreek, sugar, and garam masala through the chicken mixture; season with salt. Bring the mixture to a simmer and cook until the sauce thickens, about 10 minutes. Garnish butter chicken with remaining cilantro to serve. If you wish to use chicken breast instead of thighs, cook on High Pressure for just 5 minutes and use a natural release for 5 minutes before triggering a quick release. Add more red chili powder and garam masala for spicer version. Per Serving: 525 calories; 38g fat; 12.4g carbohydrates; 41g protein; 195mg cholesterol; 870mg sodium. This is the third different butter chicken recipe I've tried for my pressure cooker & it's another big hit at dinner. I used the "kashmiri" powder need as an excuse to hit the Indian grocery (scored some naan, raita, and paneer for palak paneer later this week!). Definitely made me feel like I was using a more-authentic recipe, but otherwise not too sure it was that different from the others. It's just a solid, solid dish. Can eat it any day. Perfect with rice. Not too bland, nor does it have so much going on that the kids wont' eat it. Good stuff@! I'm constantly in search of butter chicken recipes that can rival the one I eat at my favorite restaurant. Look no further, I finally found it! So delicious! 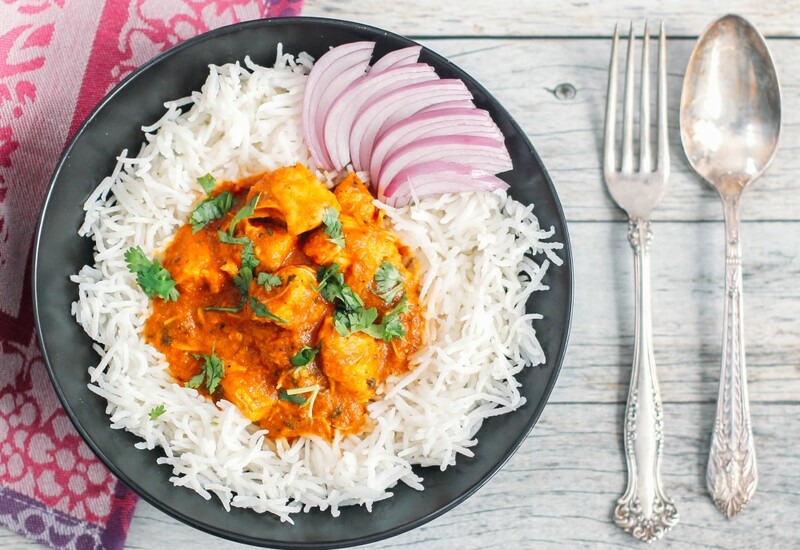 This butter chicken recipe was very flavorful and savory. The coconut milk was the perfect addition to the pureed tomatoes. I served it with a side of naan bread, which is perfect for soaking up all the delicious sauce. If you've never had butter chicken before you have to try this recipe. I used chicken thighs and the meat was so tender. This is such a great meal, especially for Indian food lovers. This is a delicious recipe. I use Greek olive oil in lieu of ghee and Italian concentrated tomato paste in lieu of the tomatoes. I also use half the sugar and add 1-2 cloves. It works well! This is now a staple diner in our family. The flavors were good. I would fry in some cumin seeds and also add a cinnamon stick. There was a huge amount of coconut water in the can, and I shouldn't have used all of it -- the recipe came out thin and had to be thickened with a beurre manié. The extra cooking overdid the chicken. Second time around it should be 5 stars! Hint: Trader Joe's sells frozen naan which would be perfect with this! Wow! I ordered the Kashmiri red pepper and fenugreek from Amazon and it was worth it. It tasted just like butter chicken from a good Indian restaurant. It far exceeded my expectations! I doubled the batch and used a 28 oz can of tomato purée instead of the tomatoes. I served it with brown rice, naan and broccoli. I had enough to feed 6 people plus a a couple of leftover lunch portions. There was still enough leftover sauce to freeze and add chicken to at another time to make at least 2 more servings. Fantastic! After a couple different trips to grocery and real food stores in my area to find all the ingredients to make this dish, I can say I’m never making this again. It was soooooo damn good, I almost ate the entire thing myself. Absolutely delectable! Such rich flavors in the nose! Paired with a good red and the recipe for lemon pepper basmati rice, it almost killed me. Making it again next week for friends. Winner in my house! Served with jasmine rice and naan. I also halved the amount of Kashmiri chili powder for my kids and it was a nice level of tangy. Well worth the trip to the Indian grocery store. Tastes just like restaurant made. Will be making this again soon! This was delicious. I think the next time I’ll be grinding down the fenugreek so that I have a powder and not whole seeds in the dish. It was delicious and super easy to make. Going to become a staple recipe.